Ligand for synthesis of polycyclic indoles via Pd-catalyzed intramolecular heteroannulation. Ligand for the palladium-catalyzed intramolecular arylation of aryl bromides under mild conditions. 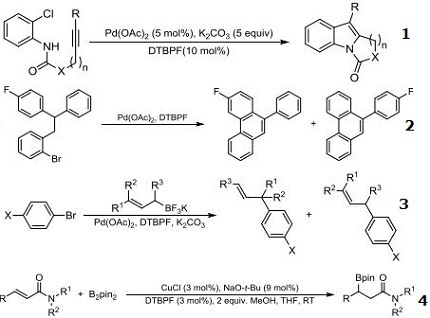 Ligand for cross-coupling reactions between bromoarenes and potassium allyltrifluoroborates promoted by a catalyst prepared from Pd(OAc)2 and DTBPF selectively providing γ-coupling products. Ligand for the copper-catalyzed system for the ß-boration of of a variety of α,ß-unsaturated amides. Ligand for the synthesis of Paucifloral F and related indanone analogues via palladium-catalyzed α-arylation. Ligand for the Pd-carbon monoxide complex catalyzed hydroxycarbonylation of aryl halides. Ligand for the palladium-catalyzed β-C-glycosylation by decarboxylative allylation to normal pyran systems,and cis-2,6-disubstituted tetrahydropyrans. Pd-catalyzed dearomative indole bisfunctionalization via a diastereoselective arylcyanation. 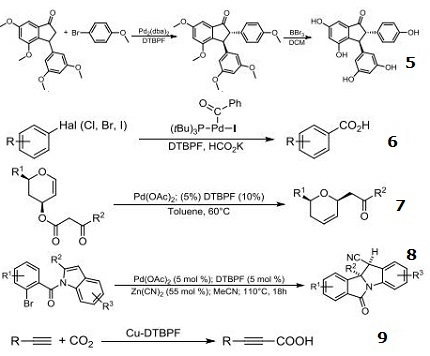 Ligand for the copper- DTBPF catalyzed C–H activation and carboxylation of terminal alkynes.